The face is in a position exposed to trauma, which often leads to soft tissue rupture, favoring the penetration and retention of foreign bodies. The present paper is a case report which aims to clarify some pitfalls in the evaluation of traumatic wounds. A 28-year-old female who was a victim of an automobile accident, presenting lacerations in the face already sutured during our evaluation, with suspicion of bone fractures. 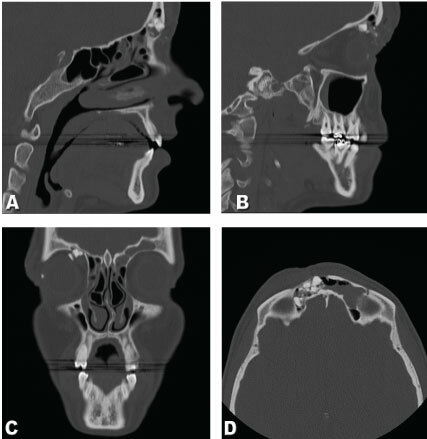 Computed tomography evaluation showed comminuted fractures in the anterior frontal sinus wall and foreign bodies similar to glass fragments within the frontal sinus and right orbit. Surgical treatment was planned and performed to reduce bone fractures and remove the foreign bodies. The patient is in postoperative follow-up without major complaints. The present study contributes to the current literature with a case where a careful diagnosis, with the collection of the history of the wounds, careful inspection of the wounds under suitable conditions lead to a good treatment of the lacerations and identification of foreign bodies. The treatment of soft tissue injuries in the face has great prominence for the care of polytraumatized patients since incorrect handling can lead to aesthetic and psychological sequels in the patients, being the objective of the treatment to minimize infectious processes and unsightly scars [1,2]. Face injuries may occur in a variety of ways, varying according to their complexity, extent, degree of contamination, etiologic agent and time elapsed from the trauma . Among the basic principles in the treatment of lacerations is the wound cleaning. All foreign bodies, such as dirt, metal, clothes and glass, should be removed with minimal mechanical trauma and adequate debridement should be performed [1,2]. Every traumatic wound should be investigated for foreign bodies, and all available diagnostics maneuvers or complementary exams should be used. Besides the history taking and visual/tactile inspection, some imaging exams should complement and in some situations determine the presence, type, number and location. Misdiagnosis of a foreign body may result in functional and esthetic complications due to migration or chronic inflammation. Consequently, patient functional impairment and permanent sequel may result in legal issues [1-5]. The present study aims to report a case highlighting the fundamental pitfalls in an adequate primary evaluation and management of traumatic injuries, especially facial injuries minimizing scarring and avoiding serious infectious processes and functional impairment, consequently minimizing the risk of psychological changes in patients. A 28-year-old female patient who had suffered a car accident without the use of safety equipment was treated at a medical emergency unit where the sutures of the presented face wounds were performed. Subsequent stabilization of the bleeding with the neurosurgery, orthopedics, general surgery and oral and maxillofacial surgery (OMFS) services were used for evaluation. The OMFS team assessed the patient after discharge from neurosurgery and found no signs of severe traumatic brain injury. The extraoral clinical evaluation revealed edema and periorbital effusions on the right side and lacerating wounds in the frontal, nasal and right upper eyelid regions, as well as alteration of the bone contour of the region (Figure 1A and Figure1B). A tomographic examination of the face showed bone displacement and fragmentation pattern in the frontal sinus region and right upper orbital border, associated with radiopaque images suggestive of foreign body fragments in the same region (Figure 1C). In addition, it was possible to suspect foreign body fragments between the upper and conjunctival eyelid, indicating ophthalmology evaluation (Figure 2A, Figure 2B, Figure 2C and Figure 2D). Visual acuity and specific ophthalmologic exams did not show changes. Due to the clinical and tomographic findings, surgical intervention was proposed to treat the fracture and removal of foreign bodies from the patient. The procedure was performed under general anesthesia and orotracheal intubation. 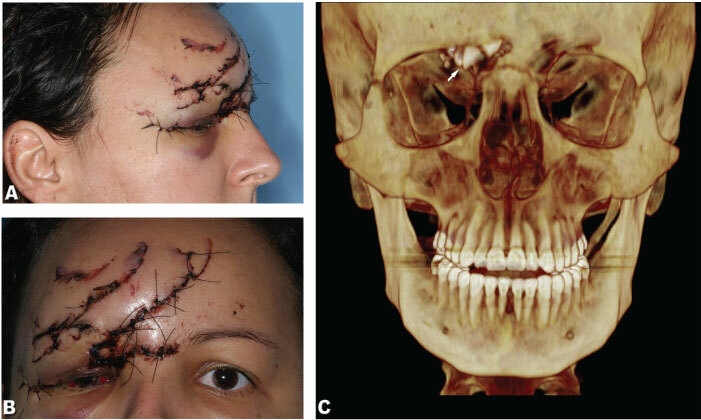 The sutures previously made in the face were removed, the visualization and access of the fractures/foreign bodies was through lacerations resulting from the trauma (Figures 3A and Figure 3B). The fractures were quite comminuted and the foreign bodies could be identified as glass shards (Figure 3C). 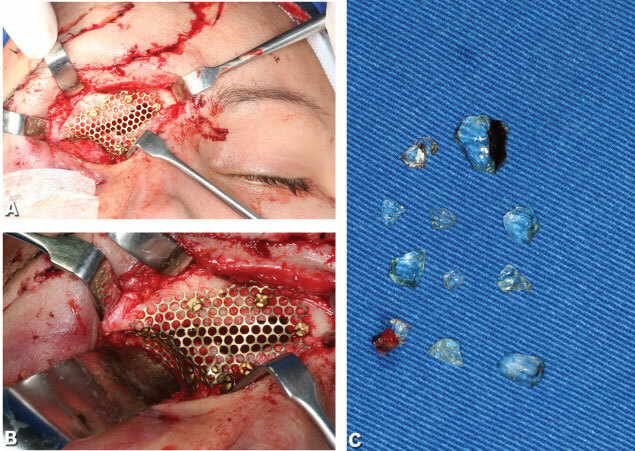 The glass fragments in the frontal sinus and between the upper and conjunctival eyelids were removed and the fractures were treated with a mini-plate of the 1.5 system with low profile and monocortical screws, in addition to a titanium mesh fixed with monocortical screws which allowed to reestablish the contour of the region (Figure 3B). In the immediate postoperative period, the patient presented an aspect of facial contour improvement in the region confirmed by postoperative computed tomography (Figures 4A, Figure 4B and Figure 4C), with procedure-compatible edema. The patient is undergoing outpatient follow-up, presenting a good clinical evolution after 60 days of the procedure (Figure 4D). Short-blunt injuries are quite frequent in trauma care services, in which 27% of foreign body injuries have glass as an etiologic factor and potential foreign body . Young adults, as reported in the present manuscript, represent the most affected age group [4,5]. With regard to the face, the anatomy is emphasized as differentiated due to the underlying bone tissues that favor soft tissue rupture, especially the orbit that represents a critical and vulnerable region since the fragile and friable tissue, together with the conformation of the eyelids, favor the retention and penetration of foreign bodies . Thus, at admission, the patient presented laceration on the face with abundant bleeding. Preliminarily, mass suture was carried out by another team which we believe had the primary purpose of providing hemostasis (Figures 1A and Figure 1B). Emergency sutures may be indicated in cases where there is airway compromise or there is significant bleeding that causes hemodynamic instability. Otherwise, lacerations are included in the secondary assessment . It is important to emphasize the importance, prior to any inspection or intervention over the wound, of the detailed collection of the history that caused the injury, occasion and etiological factor. The causative agent and the intensity of the trauma are strong indicatives of the magnitude of the trauma and possible foreign bodies present in the wound. Once the patient's history has been collected, careful inspection of the wound should be continued under minimal conditions to identify lesions in the anatomical structures and presence of foreign bodies in the wound. For this, loco-regional anesthesia, adequate hemostasis by compression, abundant irrigation and under good lighting, meticulous visual inspection and palpation of the injuries are performed. In situations where there are punctiform injuries, blind inspection and clamping of foreign bodies must not be performed since damage to important structures may occur [5,6]. A variety of foreign bodies can be found in the lacerated tissues of the patient depending on the history reported. Among them, fragments of dirt, metal, wood, glass, plastic, clothes, bone, graphite, blunt objects or even teeth can be expected, so it is imperative to investigate the etiological factor and the circumstances of the event . In the suspicion of any foreign body inside the wound, additional examinations must be performed in order to identify, locate and quantify the fragments. Several modalities of imaging have already been used and studied in the identification of foreign bodies, among them the use of radiographs, computed tomography, ultrasound and even magnetic resonance, although there is no consensus on the best method to be used in the identification of foreign bodies [5,6,9]. Due to the need to evaluate possible fractures in the face bones and the etiology of the trauma, we chose a tomographic examination, which, despite having a higher cost, higher radiation dose and being less accessible, promotes greater detection sensitivity in most foreign bodies when compared to radiographic examinations [5,9] (Figures 2A, Figure 2B, Figure 2C and Figure 2D). Ultrasound represents a method of identification of high sensitivity and is dependent on operator experience, being useful in the identification of non-radiopaque objects. It is considered a method of low precision and accuracy of foreign body position. Magnetic resonance imaging is the most costly and most inaccessible method and from a diagnostic point of view, may present faults in identifying certain objects such as wood and should not be used when metallic and ferromagnetic foreign bodies are suspected [6,9]. Furthermore, in a retrospective study, Kaiser, et al. conducted a study of the compensation for malpractice involving foreign bodies in the period between 1988 and 1994. In this study, the average time of discovery of the foreign body varied between 3 and 1,405 days, resulting in an expense for the values of attorneys at the time totaling $290,000 and indemnification in the order of $1,280,000. The author also reports that on average, the indemnity value when image exams are not used quadruples and that when the action is moved against the institution, the chance of gain of cause by the patient is 18%, while when moved against the professional, this percentage rotates around 47%. Glass was the most common foreign body with 53% of damages. Detailed diagnosis, with the collection of the history of wounds and careful inspection under appropriate conditions is imperative for the proper treatment of lacerations and identification of foreign bodies. McGregor IA (1980) Fundamental techniques in plastic, surgery and their surgical applications. (7th edn), Churchill Livingstone, Edinburgh. Key SJ, Thomas DW, Shephard JP (1995) The management of soft tissue facial wounds. 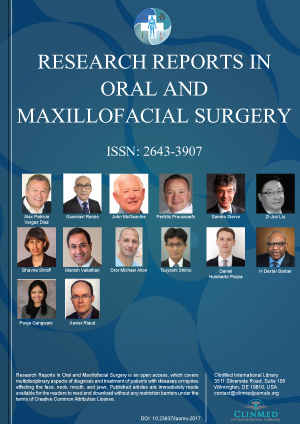 Br J Oral Maxillofac Surg 33: 76-85. 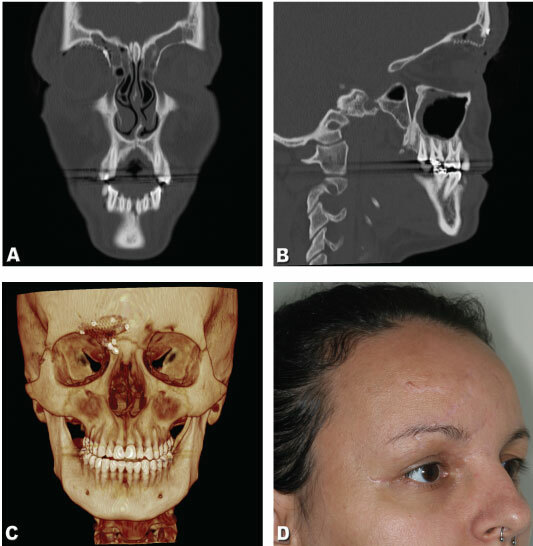 Suominen E, Tukiainen E (2001) Close-range shotgun and rifle injuries of the face. Clin Plast Surg 28: 323-327. Levine MR, Gorman SM, Young CF, Courtney DM (2008) Clinical characteristics and management of wound foreign bodies in the ED. Am J Emerg Med 26: 918-922. Capellan O, Hollander JE (2003) Management of lacerations in the emergency department. Emerg Med Clin N Am 21: 205-231. Li J, Zhou LP, Jin J, Yuan HF (2016) Clinical diagnosis and treatment of intraorbital wooden foreign bodies. Chin J Traumatol 19: 322-325. Committee on Trauma (2008) Advanced trauma life support for doctors: Student course manual. (8th edn), American College of Surgeons, Chicago. Bailey P (1984) Multiple projectile injuries secondary to motorized lawn edger use. Ann Emerg Med 13: 378-380. Sheridan N, Mcnulty JP (2016) Computed radiography versus indirect digital radiography for the detection of glass soft-tissue foreign bodies. Radiography 22: 223-227. Kaiser CW, Slowick T, Spurling KP, Friedman S (1997) Retained foreign bodies. J Trauma 43: 107-111. Vitor José Fonseca, Master's Degree Student, Department of Oral and Maxillofacial Surgery, School of Dentistry, Dental School of Piracicaba, UNICAMP, Avenida Limeira 901, Piracicaba, São Paulo, Postal Code: 13414-903, Brazil, Tel: +55-31-35913163, +55-19-981461189. © 2019 Fonseca VJ, et al. This is an open-access article distributed under the terms of the Creative Commons Attribution License, which permits unrestricted use, distribution, and reproduction in any medium, provided the original author and source are credited.